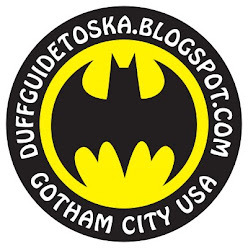 The Duff Guide to Ska: Duff Review: Heavyball "When Can You Start?" Heavyball When Can You Start? (digital and gatefold LP, Magnetic North Melodies, 2017): Their debut 2015 album Black Eye Diaries featured a super ska cover of Bronski Beat's mid-'80s synth-pop hit "Smalltown Boy" (about a gay teen's experience with homophobia, gay-bashing, and familial rejection), and an hilarious, self-aware/regretful, still-in-love with your ex/drunk bar fight song "Black Eye Friday" that manages to work in a bit of Toots and the Maytals' "54-46 (Was My Number)": "I hit him one time/He hit me three times/I was talking, when I should've been listening..." Heavyball's follow-up When Can You Start is an incredible concept album--a mod-ska-Britpop opera, if you will--about a week in the dispirited and demeaned lives of a variety of British workers that doubles as a sharp (and in many ways timeless) critique of our capitalist system if you're not amongst the Chosen Few at the top. The album opens with "Top of Your Game," where the singer is past his career prime--it's far too late for a major course correction, but he's determined to forge ahead with what he's got ("You're not getting any younger/Feel like you're in the way/You're not getting any younger/Every dog will have its day/I like it, I wouldn't change it/I still sing my song/I love it, I wouldn't change it/The show still goes on"). And the scenarios depicted in the songs that follow become more grim. "Heist" compares people involved in investment banking/hedge funds to outright (and entitled!) thieves ("No, he doesn't have a shooter/And he doesn't wear a mask/He'll empty out your pockets/All you have to do is ask/It's nothing less than he deserves/He's worked very hard for this/It's just another day/In a bank-ster's paradise..."). "People Person" is about the opposite--the forced socializing with people you'd never know apart from work driving one mad ("Is there anything more boring/Than hearing about someone else's holiday?/You had this dream where you were drowning/I hope your dreams come true some day"). "Yesterday's Man" expresses dread at the implications in the rise of automation/AI at work: "You can call the union/You can write a protest song to sing/It wouldn't change a thing/'Cause you are yesterday's man/We'll set you free with redundancy/Oh yeah, you're yesterday's man/Your time's your own/Spend more time at home." You'll have plenty of leisure time, just no way to pay for it. Individuals not suited or qualified for office work are shunted off to the service industry ("Retail is Detail": "Someday...we won't be ordinary") and others are only useful as fodder for the war machine ("Year Out" with its dissonant Fishbone-y horns and spaghetti Western ska: "Welcome son/Yeah, it was a pity, was a job well done/We know you were only 21/and martyrs never die"). The cheeriest track on the album is the bouncy, carefree ska tune "The Perils of Midweek Drinking" ("Oh my God, that beer tastes good/I want another/I want another.../And it's so good/Until the following day/When you know you should have stayed in"), which helps make work more tolerable, yet all the more miserable to do hung over. And the shimmering "After Dark" conveys the relief and small freedom people feel at the end of the work day before they have to start it all over again in the AM (and questions this way of living): "This is for all the lovely people in London city tonight.../And some might say/There's another way/Listen to the sound of the city breathing/See the sights of the city alive." The final track is the lush, numb, and defiant "No More 9 to 5" (with a chorus that you can't help but sing along with) where the singer is perhaps permanently unemployable and preparing to opt out of the system forever: "Drinking in the evening sun/Sitting with a loaded gun/And like a .45/I'm by your side/Never know what life will bring/Or the song the fates will sing/But when the story ends/I'm by your side...No more 9 to 5 for us, baby/It's a holiday, till the day we die." In sum, When Can You Start? is about wasted years, unfulfilled lives, dashed aspirations--all sacrificed, willingly or not, at Mammon's altar. 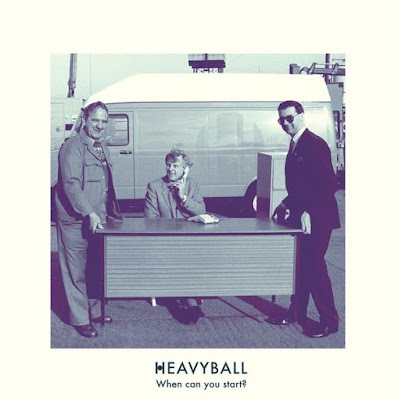 There is great sadness, beauty, and empathy, as well as bits of joy and humor in Heavyball's songs, which also seem to capture the absurdity of our economic system and the collective experience of the 99% during our current revival of the Gilded Age. Listening to When Can You Start? inspired me to pull out another British album that perfectly reflected the tenor-of-its-time: Blur's Parklike. The comparison is apt--it's that good.